Coming in at around $, the Philips Airfryer Avance is a little more than you would pay for most air fryers. However, it is larger than most other deep fryers. So, how does it stack up? Is the extra room worth the higher price? Let’s find out. This air fryer is constructed fairly solidly. It comes in black or white and has a sleek design. This extra large air fryer is fairly durable. You can feel when you pick it up that it is somewhat heavy and also sturdy. One thing to note, however, is that this is sold as having dishwasher safe components. After several washes, unfortunately, the non-stick coating of the basket may begin to chip away. It is probably better to stick to washing the different parts of this fryer by hand. The reason that this air fryer is so large is that it is capable of cooking enough fries for a family of 5 or 6. You can lay an entire bag of French fries across the bottom of the tray. Unfortunately, you still will need to cook in shifts if you are preparing a large item for several people, like chicken breasts. There is a double layer rack and a grill tray available that gives you more cooking space, but these are not included and they come at an extra cost. Another factor to consider when it comes to the size is that the inside and the outside of the Avance X-Large Air Fryer by Philips is large. It is definitely big enough that you would not want it sitting on the counter all the time (unless you use it that frequently) and it will take quite a bit of space in your cabinet or cupboard. Basically, this air fryer lets you cook anything that you can cook in the deep fryer or oven. If you buy the additional trays (grilling, baking, roasting, etc.) it allows even more cooking options. This air fryer is especially good for foods that are precooked and frozen, such as frozen fries, appetizers, egg rolls, and more. However, it is also good for cooking chicken, fish, and other meats. Two different foods to be careful with are those that are greasy (such as hamburgers, sausage, etc.) and breaded items. Greasy foods can cause the air fryer to smoke so badly that smoke detectors in your home may go off. Breaded items leave behind bread crumbs that may be blown through the exhaust of the machine. You should also be careful with flour because of the same reason as bread crumbs- they can make quite a mess! The digital touch interface makes this fryer extremely easy to use. Just set the temperature, wait for the oven to preheat (which is really fast, less than five minutes) and pop your food in. Then, set the timer and the oven will make an audible noise and shut itself off when your food is done cooking. 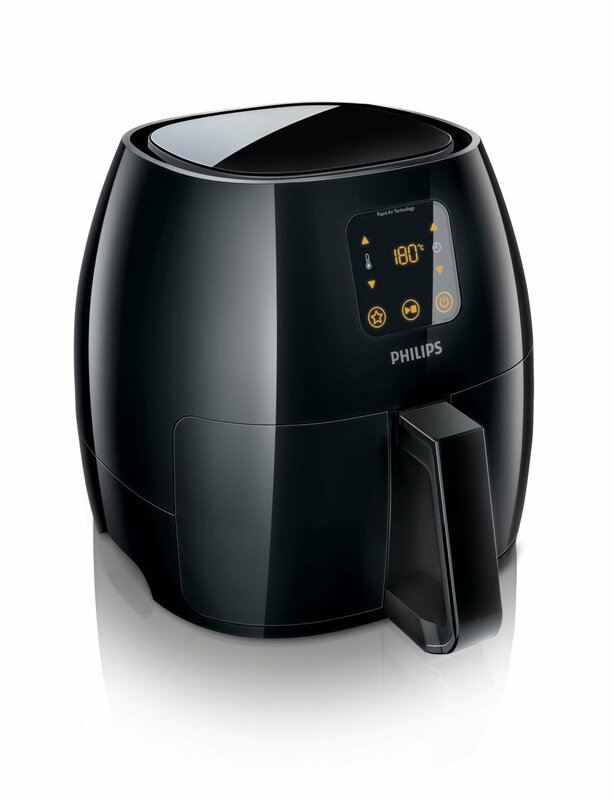 Overall, the HD9240/94 Airfryer Avance by Philips is a quality product. While some would argue that it is not worth the $ price tag, it is definitely something to consider if you have a large family (and plenty of counter space). If you are on your own, however, you may want to choose a smaller and more affordable model.